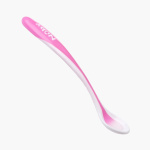 Nuby Soft Edge Feeding Spoon | Pink | Extra long grip to reach taller baby food jar. Make your baby's mealtime interesting by getting this delightful feeding spoon. Designed keeping your kid's safety in mind, this spoon changes colour if the food is not of the desired temperature. The long grip of the spoon makes it easy to feed your baby through the food jar. Feature 2 : Extra long grip to reach taller baby food jar.